Area Code 615 was the name of a Nashville country rock band active in the late 1960s and early 1970s, taking their name from the telephone area code, which at the time covered all of Central and Eastern Tennessee. The band was made up of session musicians, recording only two albums before resuming normal session work. Several of the members were backing musicians for Bob Dylan's Blonde on Blonde and Nashville Skyline albums and on recordings by Billy Swan. 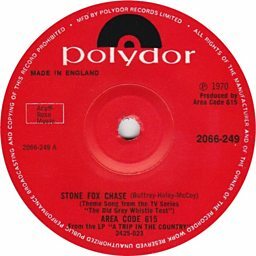 Their best known work was "Stone Fox Chase", which was used as the theme to the British Broadcasting Corporation's music programme The Old Grey Whistle Test. Area Code 615 members Wayne Moss, Mac Gayden and Kenny Buttrey went on to play with Nashville-based Barefoot Jerry, while David Briggs later worked with Elvis Presley and Joan Baez. Their cover of "Classical Gas", from their self-titled 1969 album, is sampled and featured in Irish and UK Guinness TV commercials.